Valuev, Petr [Valujev], b 22 September 1815 in Tsaritsyno, near Moscow, d 27 January 1890 in Saint Petersburg. (Portrait: Petr Valuev.) Russian statesman and writer. 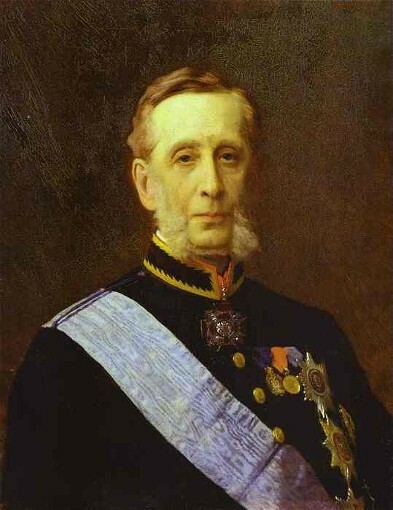 As tsarist minister of internal affairs (1861–8; also responsible for press censorship from 1862) he implemented the legislation that abolished serfdom, introduced the zemstvo government reform, and expanded the powers of the bureaucracy and police. Having been alarmed by the spread of peasant dissatisfaction, student unrest, and Polish separatist, khlopoman, and other populist and revolutionary activity, in 1862 he closed down all Sunday schools on the ground that they were seditious, and had several hromada leaders (eg, Oleksander Konysky, Pavlo Chubynsky, Stepan Nis, Petro S. Yefymenko) arrested as subversives and exiled to Siberia. In the wake of the Polish Insurrection of 1863–4 in Right-Bank Ukraine and in response to official fear of ‘separatist’ Ukrainophiles, he reacted to the application to print Pylyp Morachevsky's Ukrainian translation of the New Testament by banning it and all other publications in Ukrainian except belles lettres. 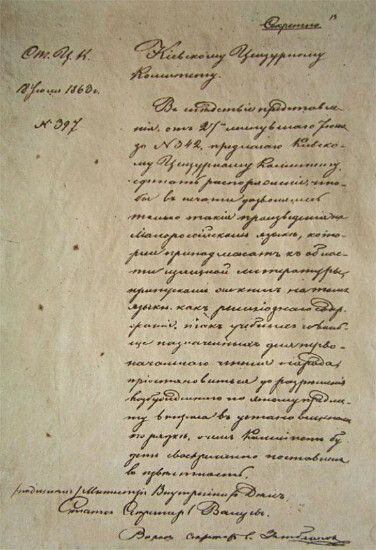 In his 30 July 1863 secret instruction informing the minister of education of the ban, he gave the motive for his decision: ‘No separate Little Russian language has [ever] existed, does exist [now], and can [ever] exist, and the dialect used by the common folk is the very same Russian language, only adulterated by the influence on it of the Polish language ... The all-Russian language is just as understandable for Little Russians as it is for Great Russians, and even more understandable than the so-called Ukrainian language, presently fabricated for them by certain Little Russians, and in particular the Poles.’ Valuev's instruction was echoed by that of the Holy Synod to its censors and was followed by a vicious campaign in the Russian press (including Vestnik Iugo-zapadnoi Rossii, Kievlianin, and Trudy Kievskoi dukhovnoi akademii) against the Ukrainophile movement as a Polish intrigue. Valuev later served as a member of the State Council (from 1868) and on Dmitrii Tolstoi's commission for gymnasium reform, and as minister of state domains (1872–9). He also headed a commission on the ‘peasant question’ (from 1872) and was chairman of the Committee of Ministers (1877–81). He chaired several bodies concerned with suppressing the revolutionary movement, created governor-general posts with extraordinary powers, and published a government-funded counterrevolutionary weekly, Otgoloski (1879–81). His diaries of the years 1847–60 (in Russkaia starina, 1891, nos 5–11), 1861–76 (2 vols, Moscow 1961), and 1877–84 (Petrograd 1919) were published.